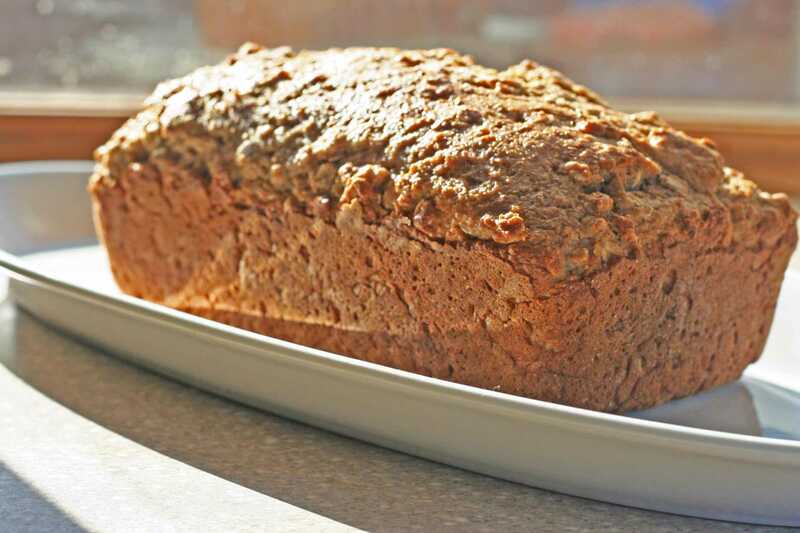 Irish Brown Bread is a family favorite traditional bread that we love and enjoy often! This recipe is a combination of family and Irish family friends that I created! Just like my Irish Soda Bread recipe, this is a blue-ribbon recipe that has won quite a few bread contests! It’s low-calorie and low-fat! Perfect plain or with some marmalade, jelly, or butter! Don’t forget a cup of tea or an Irish Coffee! Irish Brown Bread split into two loaf pans to make smaller sized bread. Okay, don’t think I am shocking anyone with my heritage! I am an Irish gal! We are now in the month of my families biggest Holiday! It is March madness time! I know you think basketball! Guess what, I love basketball too! But no, even bigger ….Saint Patrick’s Day! 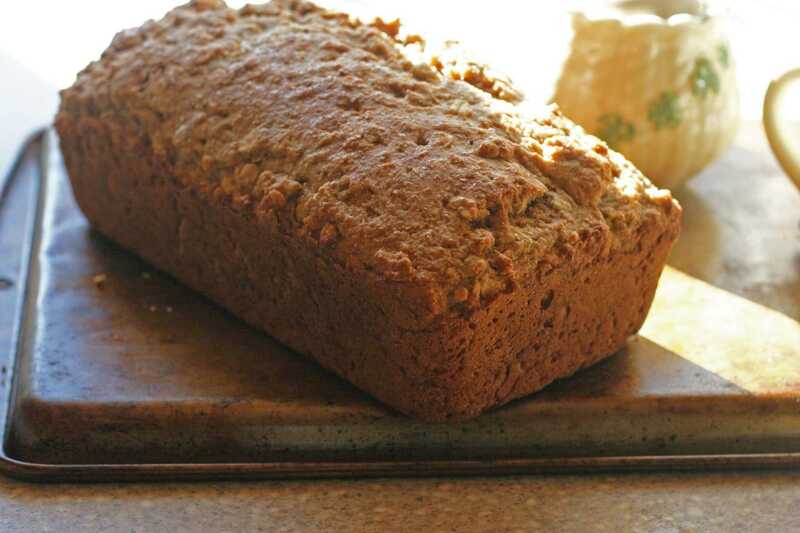 Irish Brown Bread, a traditional family bread! This is old school Traditional Irish Brown Bread! I love this bread as a side with my Granny’s Bangers and Mash! A great bread to dip into the Guinness gravy! It is a hearty bread that is not sweet! When visiting Ireland, my family, any Bed and Breakfast or restaurant serves Brown Bread with breakfast! I have made my own version of that bread and it is so good! Can Irish Brown Bread be made ahead and frozen? Absolutely! My Mom makes her bread and freezes slices together and removes from freezer as needed! What does Irish Brown Bread taste like? Brown bread is not a sweet bread. It is a hearty bread! My Dad always says its a stick to your ribs bread because it is filling too! Can instant oats be used to make Brown Bread? I do not recommend instant oats. Regular oats are my recommended ingredients for this bread. What can I use as a buttermilk substitute? I grew up eating Irish Brown Bread. I make this bread quite often as the family requests it all the time. Everyday tip – this freezes so well. It can be frozen as a whole bread or slice it up and freeze for individual portions! Seriously do that, its amazing, I am not kidding! 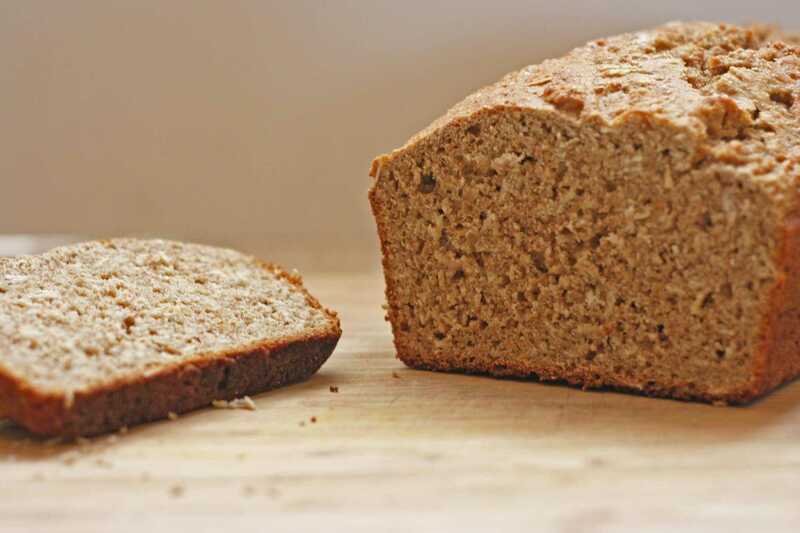 If you have not had the pleasure of a slice of Irish brown bread, you are in for a little slice of HEAVEN! 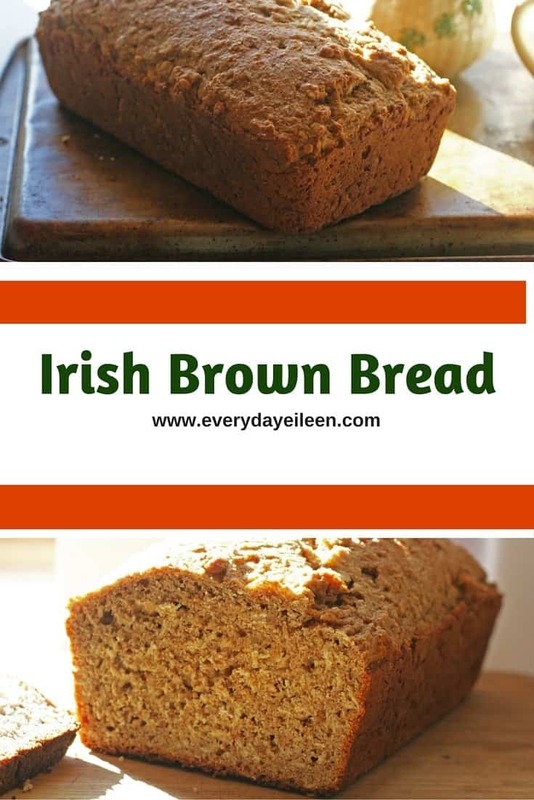 So my friends, I hope you all get into the Saint Patrick’s Day season and make a loaf, or two, or three of this Irish Brown Bread! Have some with breakfast and don’t forget to save some for a bowl of my The Best Beef, Mushroom Guinness Pie! Feel free to get creative! Send me a photo on Instagram with the #everydayeileen, I would love to see your creations! Preheat oven to 375 degrees. Spray a cast iron pan or round pie pan with non-stick cooking spray. In a large bowl, add the whole wheat flow, quick-cooking oats, sugar, salt, baking soda, and baking powder. Cut in the butter and blend well into the flour. Make a well in the center of the dry ingredients. In another small bowl, whisk the eggs and add the buttermilk to combine. Add the egg mixture into the well of the dry ingredients. Stir to combine the ingredients. Gently roll out the dough onto a floured surface and knead the dough gently for a few minutes. Shape into a round loaf and place in the cast iron skillet. Slash the top into the shape of a cross. Sprinkle top with a bit of flour. Bake for 40-45 minute. Check to see of the bread is done by placing a skewer into the center of the loaf. If it comes out clean, your bread is done. Let cool for about 10 minutes on a wire rack. Remove from the loaf pan and let the bread cool completely before slicing. At least 1/2 hour. The nutritional data I provide is an approximation and actual dietary information can vary based on ingredients and proportion sizes. Thank you for letting me know. I recently updated the recipe and I must have dropped it from the instructions. I have corrected the instructions oncludong th baking powder. Love the recipe make it all the time!! That is fantastic Deirdre! Today must be a baking day for Irish Brown Bread! I am so happy you enjoy the recipe! I have not made this one in a while because it has been so warm, that will change this week! Just tried your recipe but have a problem with it. I thnk I must have used the wrong size cup (breakfast one) and ended up with an enormous amount of flour so had to add a lot of extra liquied and even then no way would I be able to spoon it into the pan, far too dry! It is taking ages to cook and risen so much I have had to cut some of the top off as it stuck to the top of the oven!! Hi Patricia, using the wrong measuring cup will definitely change not only the consistency of the bread but will also affect how much liquid is added and the cooking time. I suggest using a dry measuring cup and scooping the flour into the cup. Level the bread by using a knife. Also, did you use whole wheat flour? I hope this info helps. I will be updating this recipe with tips this week. I have been getting a lot of emails with questions over the past few weeks on this recipe and a few others. I hope you check back for them and I hope you did enjoy the bread. I hope you have a fantastic day and please ask any other questions or any clarifications from me. I want you to enjoy the bread as much as my family! I discovered my mistake – the cups I used were more Breakfast size – doh! The Bread ended up so large and heavy I thought of using it as a brick for a wall. it was unbelievable and we had a good laugh! I am now about to give it another go using the proper size cups!!!!!! Excellent Patricia, I’m glad you found a better measuring cup for your flour. We have all made that kind of a mistake. I’m happy you could turn a lemon into lemonade! I am glad you are remaking and let me know how it turns out. Enjoy with a nice cup of tea! Hi Eileen, I have made this bread a few times now with regular oats. The first one was too dry . So now I just add more liquid till it looks right. I use Kiefer milk instead of buttermilk.. it tastes great and we love it. Thanks for the great recipe. Is it ok to use regular buttermilk ( instead of low-fat)?? Hi Holly, absolutely. Even though buttermilk is naturally low-fat, I save calories by using the low-fat version. The regular buttermilk is absolutely fine to use as well. I hope you enjoy the bread. I found the bread mixture very dry, what did I do wrong??? Hi Sharon. wondering if you measured the ingredients? Did you use quick cooking oats? Did you use buttermilk? It is hard to say, I haven’t had an experience with a dry Brown Bread. I would say try it again. Make sure the ingredients are measured precisely and if when mixing the ingredients it still feels dry, add an additional amount of 1/4 cup of buttermilk. Please let me know how it works out. Hi Heather, I have not made this particular bread with regular oats. I know someone who did and they said the texture was different than when using the quick oats. If you decide to make it with the regular oats,please let me know how it came out. I have made this 3 times already. It is a delicious Brown bread recipe that tastes just like a slice of Ireland from when we lived there! It has an authentic taste and texture. Thank you for this simple quick recipe, I love it. I just made this yesterday and I have to say the recipe is just as easy as advertised and even more delicious than promised! I love that it was assembled in minutes and I could just set it to bake and go about other tasks. My whole family has agreed, it’s an absolute keeper, Thank you for sharing! Thank you Stephanie! I am so glad you and your family enjoyed the soda bread! It is a family favorite and I hope your family continues to enjoy! Happy Saint Patrick’s Day! This looks great and super simple! Nothing beats freshly baked bread! Thank you Ashley! I so agree, love fresh baked bread! I *love* Irish brown bread! Every time I went to Ireland for work I would come back with a few loaves in my suitcase. I had no idea it was so easy to make – that it was a quick bread without any yeast or fuss. Thank you for this recipe, I am pinning it for sure! Bread is my weekness. I can give up almost anything but bread. This sounds amazing. I can’t wait to make this bread to go with my soup this week. Thanks for the recipe. I am so happy you enjoy! Send me a pic when you make the bread with your soup! Great recipe! Perfect timing for St. Patty’s day. Nice to have something different to bring to pot lucks this time of year! I am so glad Roxanne. Let me know if you prepare this and how it works for you. I’ve never tried Irish Bread before but it sounds delicious! I’ll have to try it soon. I hope you do ! This is so tasty! My mom used to make homemade bread and you just can’t beat it! I’m nervous to try bread at home, though!!! Oh dont be. This is an easy one to start with as there is no yeast. its literally a 5 to 10 minutes of prep time! This sounds amazing! I am going to have to try it soon. We love bread in this house! Homemade bread really is the best. This looks great and thank you for sharing your heritage ! I grew up in an Irish family so this recipe hits close to home! I cannot wait to try it out and see if it taste like my grandma’s. I love homemade bread. I usually make a honey oat bread for our everyday, but this looks delicious! I think I will have to try it. I hope you do Heather. Super easy to prepare! This looks really good. I wonder which gluten free flour would work the best for this recipe. I love that this has oats in it as I love oats. I may just have to make a loaf to try! We love Saint Patrick’s Day here. I’ll be making this bread for my crew! I was just thinking about my moms Irish Soda bread this week. I should ask her for the recipe. This looks really yummy! I’ll need to try and make some for my family! Perfect for St. Paddy’s Day! I am going to try this recipe! I am so happy, enjoy! I love trying new foods and this looks absolutely delicious! I need to catalog this so when I host my next country themed dinner I can do Ireland and serve this! I have never tried Irish bread what would you say it tastes like apart from bread lol! I would like some with pumpkin soup. I do love an easy to make bread recipe that I can freeze for later use as well. I may try and see if I can tweak it to be gluten free as well.. Off to the kitchen to try! !